The Carnegie Room is a bright and welcoming space perfect for larger gatherings. The room has adjustable lighting, including a dimmer, and a stylish kitchenette. This room can be set up in a variety of options and is suitable for workshops, seminars, or presentations. Monday to Friday – 9:00 a.m. to 8:30 p.m. Please note that effective January 1 2018, you are responsible for setting up the room. Please give yourself enough time to set up chairs and tables before your meeting and to clean up afterward. We ask that the room be left as you found it. To book a room, or for any inquiries, please call the library at 519-631-6050, or email us! Start your application now by filling out and printing this form. Cancellation of meetings should be made with as much advanced notice as possible. Failure to notify the library of cancellation may result in an organization being excluded from further scheduling at the library. The library reserves the right to reschedule or cancel meetings when necessary. In 2015, our Board Room was named “The Carolyn Kneeshaw Board Room” in memory of the long-serving former CEO and chief librarian. This glass-surrounded room looks highly professional with board table and adjustable, ergonomic chairs. It’s perfect for meetings or group discussions. Please note that effective January 1 2018, you are responsible for setting up the room. Please give yourself enough time to set-up before your meeting and to clean up afterward. We ask that the room be left as you found it. 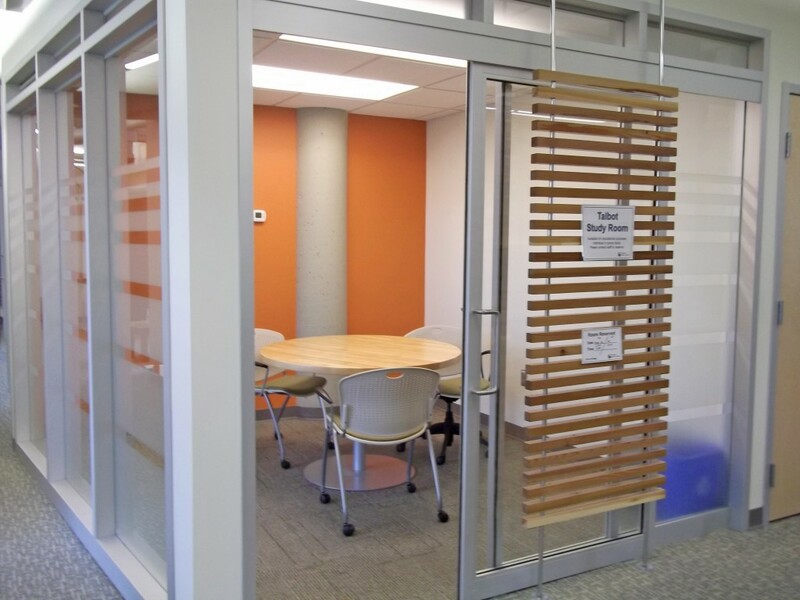 St. Thomas Public Library has two study rooms that can be reserved free of charge for groups of 4 people or fewer. These rooms are ideal for solitary studying, or for tutoring! They are only available during our regular opening hours. Please note: you may only reserve a room for up to 3 hours per day.